Location: Up north, where the stars are. I know this isn't coffee, but I figured this would be a good place to start with this question. I am looking for good online retailers to buy whole leaf teas and tea accessories. Anyone have one the frequent? Re: Recommendations for Tea Retailers? I have not ordered tea but they have a nice supply. Mr Moo might have some places he uses that he might recommend. I found a great tea shop in the Venitian Mall in Qatar. The saleswomen were very attractive and playful. I know it may be a bit of a trip to get there, just trhowing it out there. Mostly Chinese tea ... shop is in China but their service is quite good. I've purchased from them many times. I prefer Jing because you are closer to the source, but have purchased from all of these guys multiple times. How can you have any pudding if you don't eat your meat? I have a friend in the Airforce. His last deployment was in Qatar, maybe if he goes again he can pick some up for me. Thanks for the recommendations guys, I'll check em out! 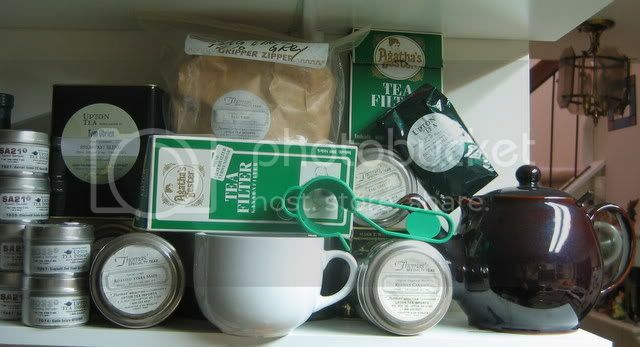 specialteas.com is a pretty good site as well. They have a broad range of teas, great services and a wealth of tea info. Easy and vast online selections. Without a doubt, I second this suggestion. Been using them for over 20 years. Prices cannot be beat, quality and service are excellent. http://www.teasource.com/ is another great place. They are my local tea shop, my B&M so to speak and I love their teas. I don't have much experience with other retailers but I have always enjoyed what I've gotten from them and they have always treated me right. Even though I have never ordered from them, this is my new favorite tea company. I just found out they donated 70 lbs of tea to the Tax Day Tea Party. http://www.teavana.com/ I use these guys because they have a shop close to me and an excellent selection and quality. I try to visit it any time I am in the city. English Tea Store has some very good deals on tea. Don't get ripped off, try ETS. I'll second Teavana. Ridiculously expensive but oh so delicious. Herfergrrl's blog - The Art of the Good Cigar: A Matter of Taste. Herfing is the most fun you can have with your clothes on. If you're ever in NYC check out their shop on Madison Ave.
A hearty second for Special Teas. Of the 3 or 4 online retailers I've purchased from, they've had about the best quality, consistently. If one truly believes in an all-powerful deity, and one looks around at the condition of the universe, one is drawn inescapably to the conclusion that God is a malign thug. Depends largely on what you want. Special teas is nice for decent tea. as is Adagio. http://funalliance.com/ is a nice start. http://www.jingteashop.com/default.cfm (Great tea, enthusiast level, direct from china).